A content delivery/distribution network (CDN) is a global network of proxy servers in different locations worldwide. This system aims to improve the performance and efficiency of Internet-based technologies, by reducing bottlenecks in the system. A CDN focuses majorly on video and many other rich media. A CDN can be considered as the transparent backbone of the Internet that has been built for ensuring the high-performance delivery of rich multimedia content. Our demand for“anytime, anywhere, any device” access is increasing day by day, Content Delivery Networks (CDNs) are basically used to efficiently meet this demand. CDN System catches content from geographically distributed servers in various locations; they ensure high-performance delivery by filing requests from the closest server to the clients. Our CDN service is smart and efficient, we provide you with the following services. HTTP gives us the ability to make a request to the server and find out whether the server has a new version of the resource available that has been previously cached. We don’t want the clients to blindly cache the content they were previously provided, so using conditional caching, the client can ask the server whether a resource has been updated in any way. This great feature is used to increase the speed of CDN so that data can reach the client faster. In fact, through conditional caching, the data transfer rate is increased by an astonishing 94%. Furthermore, for increased efficiency, these requests can also be put in front of a public cache so that we can have a common cache for resources unlike a private cache, which is only utilized by a certain user’s browser. For delivering large data, range caching is one of the most efficient methods. HTTP provides us with the best tools for range caching. It converts our data into small pieces that are called segmentation in terms of networking and then sends it in individual packages. The overall performance and speed of the CDN greatly depend on our range caching. If you’re going to deliver large resources through byte ranges then both the cache lock and cache slice techniques can minimize your network traffic and give you great content delivery performance. The cache fill operations can be performed by using the cache lock technique, it’s best suited when we can accept a sharp increase in traffic to the origin server while the fill is still going on. If cache fill operations are very slow and the content is stable that means it’s not changing that much then you can use the new cache slice technique. Day by day live streaming of video over the Internet is becoming a demanding procedure, as it not only requires loads of bandwidth, but it also demands a great deal of power as well. 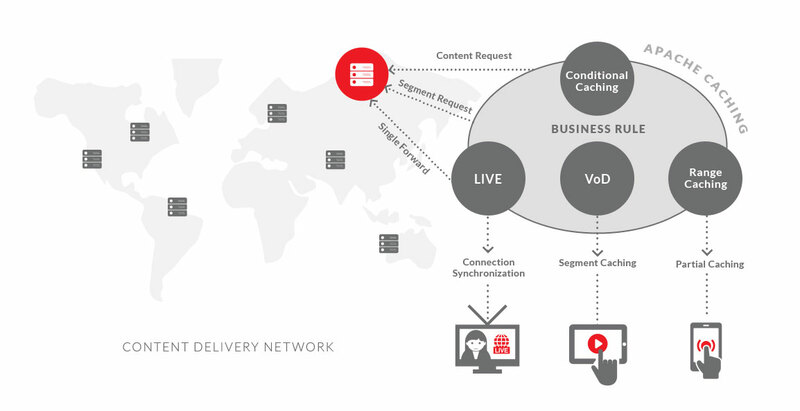 Using a content delivery network (CDN) you can broadcast live with fastest delivery speed possible and best user experiences. To effectively stream video online, you need to choose the right CDN. A CDN with largely distributed servers all over the world, you can enhance the quality of live streaming. If you’re a media network administrator then you are often looking for effective solutions to provide high-quality video on demand, a video on demand content delivery network (VoD CDN) then holds a tremendous promise for you. Clients today are not just looking for fast access to video on demand; they also want the experience to be broadcast quality. A VoD CDN is an effective and cost-efficient way to help media network admins meets the expectations of the clients. By filling requests for video from the servers that are nearest to each user’s or client’s location, a VoD CDN accelerates delivery of the content. CDN is becoming a necessity for running a successful company in this fast moving and ever-changing economy. By catering you with the services that your business needs, CDN can enhance the chances of growth & success of your company. Choosing the best CDN solution for your needs is a very important thing. By giving you specified and geologically closer data center locations our service makes sure that you get the best and fastest content delivery.